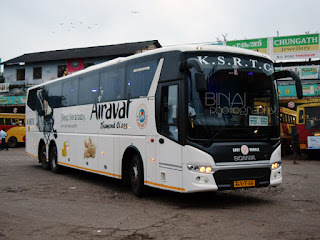 When the first Volvo B7RLE rolled on to the streets of Bangalore in January 2006, the city - and the local transport provider, Bangalore Metropolitan Transport Corporation - took pride in being the premiers in providing such advanced modes of transportation. Today, the city leads in the number of Volvo buses being used for urban transportation, with over 340 Volvo buses on the roads. While this passenger friendly move of BMTC has to be appreciated, the corporation falls flat when it comes to complete - and proper - implementation. Most of these volvo buses begin their first trips from the city not before 0700~0800, and invariably finish their last trips by 1800~2000. And, to add salt to the injury, the buses run opposite to the direction of passenger density on many routes. Take for example the case of Route number 365. About 11 buses are operated on this route (and its sub-routes 365B and 365J). This route originates at Kempegowda Bus Station and terminates at Bannerghatta National Park (Gottigere in case of 365B, and Jigani in case of 365J). The main crowd density is from Corporation Circle/Shanti Nagar Bus Station to BTM Check Post/Bilekahalli/Arakere/Hulimavu. The first bus on this route runs from Jigani to KBS (on 365J). This bus is infamous for its pathetic punctuality - the bus could land up upto 15 minutes late during its very first trip. The service on this route is even pathetic during evening hours. One bus crosses Shanti Nagar Bus Station (henceforth referred to as SNBS) between 1755~1810. If one misses this bus, the next one comes only at 1905~1915. And the one after that is at 1930 and the last one somewhere around 1945~2000. The last two buses are unreliable, and on many occasions they never turn up. The frequency of other buses heading towards Bannerghatta Road, from SNBS during evening hours is even more pathetic. Take for example, the case today. I was at the bus station right from 1810 till this particular volvo came (today at 1915). The bus today was KA01-FA-1744 of Depot 13 (Kathriguppe). 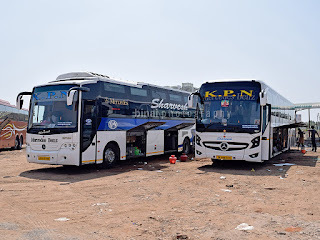 During the 65 minutes I remained at the bus station, just two Suvarnas (on 365J), one Parisara Vahini (on 365D) and one Ordinary (on 369D) went through the bus station heading towards Bannerghatta Road - that is just 4 buses in a span of about 65 minutes! The passenger density towards Bannerghatta Road is predominantly the working class - Office goers and daily wage workers - and their main mode of transport is BMTC buses. Running just 4 buses in a span of 65 minutes at the peak of evening traffic is absolutely unacceptable. Even more horrible is the fact that there were NO buses towards Bannerghatta Road between 1840 and 1915. Two buses came together at 1915 - one empty bus from the Depot (this one worked 366E to Jigani) and one Volvo towards Bannerghatta (the one mentioned earlier in this post). The Volvo bus had atleast 120 passengers in it (Against its official capacity of only 70 passengers). There was absolutely no space to move around, and the conductor immediately asked the driver not to open the door for more passengers - I could understand his helplessness. The door couldn't close if all passengers were in, and there was little space for more pax to join us. During my 65 minute wait for this bus at the bus station, three Volvos headed off to Narayana Hrudalaya (Route #356N), two to Electronic City (Route #356C), one to HSR Layout (Returning to depot), and two working "Blue" line service. This was not my first experience waiting this long for a bus - the evening peak hour service leaves a lot to be desired. Its high time the BMTC pulls up its socks and get into serious business. 90 percent of BMTC buses are timed to the convenience of its operating staff - with buses coming out of the depot only by 0700~0800, and returning back to the depot by 1700~1900. This is absolutely unacceptable - these buses are intended for passengers to use them for their daily commute. It is no wonder that the number of cars on Bangalore's roads are raising by the day, and the number of passenger shunning these inefficient buses are also increasing by the day. Not an isolated case: The number of Volvos reduce exponentially on Sundays and other Holidays. The BMTC on one hand announced concession fares for passengers on holidays, and on the other hand it reduced the number of services! What kind of logic is this? I feel it is unfair to take for granted that the number of passengers on sundays are less - with MNCs and BPOs working on all the seven days of the week, there are bound to be as much passengers on Sundays as other days. The number of people going out for some shopping or some sightseeing is very high on Sundays - these population should be incentivised to travel by bus, rather than forcing them to pull out their own vehicles. When is the BMTC waking up? The pic says it all! Such excellent patronage on 365 in the evenings certainly deserves better service. I get the feeling that BMTC is treating some routes on a stepmotherly basis - for instance, the route 335E (and 333 and related routes on Old Airport Road) has a bus plying EVERY FIVE minutes! And I have seen them right from 7 am to 9 pm!Similarly, 360B leaves KBS from 7 am onwards every 15 minutes or so, and the morning trips are quite crowded! I feel BMTC will be losing revenue of it fails to take care of the substantial passenger base on BG Road. I have also noticed a lot of Volvos at Shivajinagar recently. The intention is certainly good, but better implementation is needed. BTW, what route does V-368 take between SBS and Dairy Circle? Also, are there any depots on BG Road? I think it is more of 356Cs during the morning than 360B - this is purely my observation on my way to office. The ITPL routes have good patronage, but the kind of frequency currently offered is at times an overkill. It is really sad that BMTC doesn't look beyond a set of routes. However, of late, I noticed that even these buses (the ITPL ones) too disappear mysteriously on sundays. The frequency comes down to one in 15-25 minutes. Shivajinagar is still lagging behind badly in terms of its "volvo connectivity". There is one route heading to ITPL from Shivaji nagar, Orange line service and one bus connecting Shivajinagar and KBS. The volvos on #368 - another rare species, along with 411K - go via Dairy Circle, MICO, Anepalya Gate, Vellara Junction and on to Shivaji Nagar. The first bus on 368 departs from Bannerghatta only at 0930, and the last bus goes at 1630. In the other direction, the first bus is, again, at 0930 and the last bus at 1640. No idea which office goer gets benefitted by these buses. 411K (BNP to ITPL) is another interesting story - first bus at 1230 and last bus at 1630 (From BNP)!!! BG Road has a depot at Jigani (Depot #27). But Volvos on this route are mainly from Depot 7 (KBS)and Depot 13 (Kathriguppe). I think route no v360B/v356C/v356N is most pampered route of BMTC. It may be due revenue generation. Recently I saw V360M (Anekal to KBS). BMTC can also experiment of introducing volvos on SBS-BNP Sector. On BG Road, the Guruappanapalya_SBS segment is revenue earing. As Route No. 161(this route number has been devised by the crew themselves KA-01/FA509, KA-01/F671, KA-01/FA1123) opertate from Jayadeva to SBS, the collection of R.NO.368 takes beating. Apart from this there is BIG 10 (BNP to P Chrch), 368F,368E and MBS No. 13 which further eats the revenue of Route No. 368. The most pampered route in BMTC is undoubtedly 333/335 series. Do you think that the image showed a bus full of "free travellers" that BMTC should be worried about revenue? There are very little passengers on the Bannerghatta route who travel with Gold Passes. 99% of passengers on this route are daily ticket purchasers (on volvos). You were talking about 161/368F/368E/MBS13 taking away the patronage of 368 - Could you please enlist the frequency that the said routes ever have? Not more than one in about half an hour. 368 itself runs not more than a bus every hour. The frequency of services between SBS and Bannerghatta Road is pathetic. The new Big10s are slight consolation - but them terminating at Brigade Road itself turns out to be a huge disadvantage. Moreover, except MBS13/368/Big10 all other buses go via Wilson Garden-Shantinagar-Richmond Circle - a longer route and at times time taking. MBS13/368/Big10 connects Bannerghatta Road directly to Adugodi and Johnson Market. Regarding R.No.368 low frequency, I remember this bus was operated from 3 depot (MEF-379) with two shifts. This was bus was regular and had good patronage. During 1990s this route was shifted to Depot 4 (CAF 168) from where this route doomed. 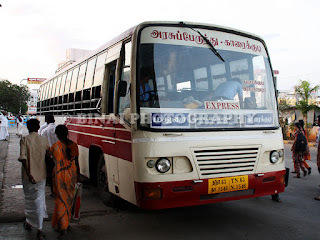 The crew alloted to this route were least interested in running this route and as prevailing in those days they used take this bus to different routes with the connivance of TC posted at the SBS. Later this route was re-transferred to Depot 3 and KA-01/F47X was allotted to this route. I think this bus is running on general shift(doubtful). At present KA-01/FA 121X is running in this route. As suggested by you if BIG10 is extended upto SBS, it will be more helpful (short route to BG Road). I have been going through your writeup/photos in your blog/irfca website regularly. You are doing a great job.